Our planet is under serious threat from industrial civilization. Yet activists are not considering strategies that might actually prevent the looming biotic collapse the Earth is facing. We need to deprive the rich of their ability to steal from the poor and the powerful of their ability to destroy the planet. We need a serious resistance movement that includes all levels of direct action–action that can match the scale of the problem. Writer and activist Derrick Jensen has been discussing the inherent destructiveness of industrial civilization and urgently calling for resistance against it for decades. Derrick is the acclaimed author of fifteen books, including A Language Older Than Words, The Culture of Make Believe, Endgame, and Deep Green Resistance, a book, co-authored with Lierre Keith and Aric McBay, which inspired the formation of a movement by the same name. Author, teacher, activist, small farmer and leading voice of uncompromising dissent, he has been hailed as the philosopher poet of the environmental movement. 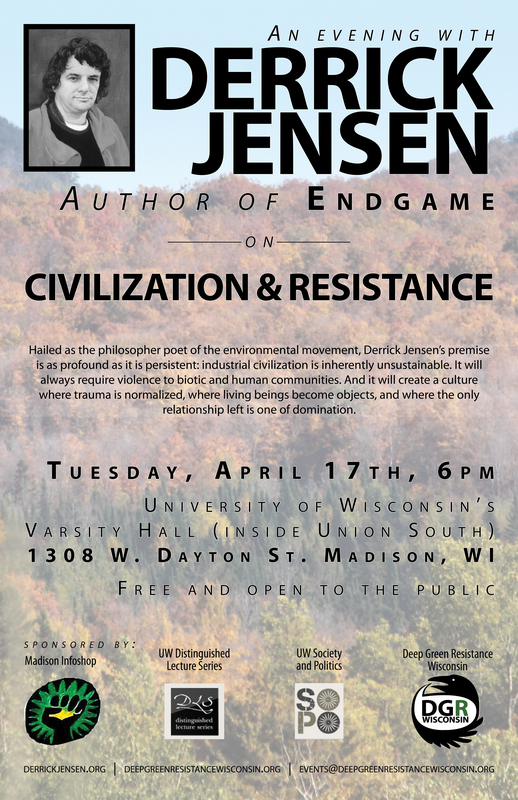 We are pleased to host Derrick Jensen for a public speaking event on “Civilization and Resistance,” with a Q&A session after the talk. Please join us for this exciting opportunity at the University of Wisconsin’s Varsity Hall (inside Union South), located at 1308 W. Dayton Street in Madison, Wisconsin, on Tuesday, April 17th starting at 6:00 p.m. This is a free event and is sponsored by Deep Green Resistance Wisconsin, UW Society & Politics, Distinguished Lecture Series, and The Madison Infoshop. How do I know civilization is not redeemable? Why does industrial civilization need to be dismantled? Do you think our advanced society has the capability to find technological solutions to the energy and resource problems facing us? If Industrial Civilization is dismantled, what about people who live in cities or rely on it for their subsistence or medical needs? What makes you think that a small group of people have the right to bring down an entire system that will result in countless deaths? The dismantling of civilization would be a violent act, and violence is never the answer. Ghandi was a pacifist that led a successful revolution, so couldn’t a nonviolent movement of the masses put enough pressure on those in power to transform our society? I am skeptical that any actions I take will be useful towards bringing down civilization. Why should I take large-scale direct action against the system when almost nobody else, especially in the first world, is? This entry was posted in Education and tagged DGR activity & statements, Derrick Jensen on March 28, 2012 by Deep Green Resistance Wisconsin.